One of the best things about modern life is that it’s easy to be a well-informed consumer. Since there’s so much information available right at our fingertips, we can research just about any product or service before making a decision. Take buying a car for example – most people would never dream of making such a purchase without researching it thoroughly beforehand. Dental treatment is no different! This is particularly true if you’re thinking about a procedure like dental implants in Wethersfield that involves a significant investment of time and money. In this blog, we’ll give you a head start on your research by reviewing what implants are and four important factors to be aware of beforehand. Dental implants are a tooth replacement option that look and feel much more like your own teeth than other options. Why? Because implants replace more than just the crown, or the white portion of the tooth you see above the gumline. They replace the root as well. 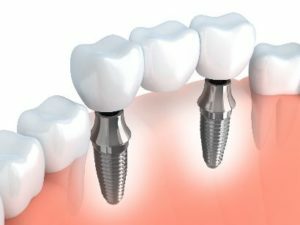 In fact, the term implant only refers to a titanium post that’s placed in the jaw to take the place of the root. This crucial feature is what is responsible for giving the implant unparalleled strength and stability. When the implant has healed, a crown is attached that is matched in shape and color to the existing teeth so that the end result looks completely natural. The word “surgery” can sound scary, but remembering that even a simple tooth extraction is considered surgery can put it into perspective. This surgery is the first phase of getting an implant, during which the titanium post is placed in the jaw. This is done in-office and generally takes around two hours. Then 3-6 months are given to allow the post to fuse with the surrounding jawbone. Getting an implant isn’t painful. Your dentist in Wethersfield will begin by making sure you’re fully numb and comfortable before the implant surgery is done. Many people are surprised that this phase of the procedure is so easy! You may have some mild tenderness afterward, but your dentist will give you post-operative instructions for how to take care of that, including simple remedies like over-the-counter painkillers. Your customized treatment plan depends on how many teeth you’re missing. If you’re missing an entire arch, you might benefit from four implants being placed to provide stability to a denture. If you’re only missing one or several teeth, your plan could involve 1-2 implants and possibly a bridge. Your dentist will be able to discuss all of your options at your consultation visit. Lifestyle factors such as smoking and overall health are always taken into consideration. Smokers have a significantly higher risk of failure than non-smokers and may not be good candidates. Also, if you’ve been missing your teeth for a long time, chances are that you’ve lost some of the bone mass in your jaws. You may have the option of getting a bone graft procedure or your dentist may recommend a different treatment altogether. Dr. Thomas C. Dolan and Dr. Brendan Dolan are general, cosmetic and restorative dentists in Wethersfield who understand the importance of educating their patients about their dental treatment. They love having modern options like implants available to restore their patient’s oral health. If you’d like more information about the implant process, they can be reached through their website or at (860) 529-2000.